Instead of continuing to take over the T-TRAK thread currently going on here on TRW, I'm going to start a thread for a T-TRAK module that I've been inspired by other 's to build. Since T-TRAK is a double track mainline, and I've long been a fan of the RF&P since my college days in Richmond, Virginia, this is a good fit. So, the plan is to model a piece of Ashland, Virginia, where there continues to be a form of street running to this day on CSX's former RF&P mainline. General Counsel to the Laurel Valley Ry. Tempting, but I'll probably just build the streets and crossings from scratch. I'll keep this in mind, if I get particularly lazy, though. Since you're doing double track, I can highly recommend the double track concrete tie stuff. I assume you'd paint the track anyway, so the tie color doesn't matter, but the spacing looks way better. Next important question... do you want to purchase those GP40s back? I'm more than happy to let them (and the caboose) go home for what I paid for them. Go Dave! Go Dave! Go Dave! Go Dave! Can the concrete ties be made to look like wood? Because the RF&P's ties were wood. I hadn't thought that far ahead. I'm not really going to be able to run anything on this module at home, since I won't have any controller, but I do really like those Geeps. We'll talk, hopefully, this weekend at the show. 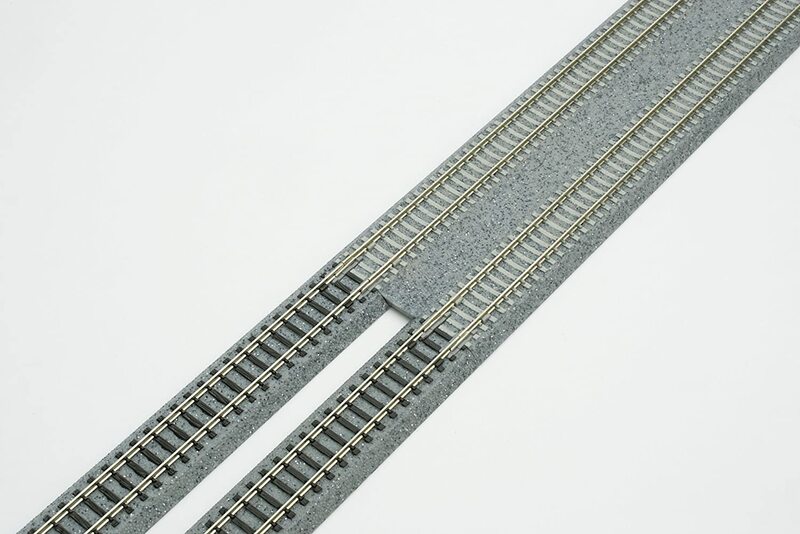 Oh yeah, in fact, I think the concrete tie track, when painted, will resemble wood ties better than the regular unitrack. It doesn't matter for most of my stuff, but it DOES matter for the 1st class RF&P. And that sounds good about the engines. I've kept them safe. How so? I thought the concrete ties have a distinctive shape that includes a taper and a dip in the center. a little weathering and a thin wash would go even further to create the illusion of wood ties. Dave, will your module include the trackside Henry Clay Inn? Spent the nights of the 1999 UnCoNveNtion there with NVNTRAK, but we didn't get to see a grade crossing collision like you caught on the web cam. I've often thought the whole RF&P main between Richmond and Alexandria has several scenes that are TTrak friendly, including downtown Fredericksburg, the bridge over the Rappahannock, and a couple other locations. Great idea! I've never actually seen Ashland modeled, which I always found surprising. Looking forward to seeing this. I dunno. I'm still researching it, but I wouldn't have any aversion to anything that screams "Ashland." I can add that to the list of candidates. Thanks! I love shots of the bridge over the Rappahannock River, but I don't think that I could do that justice on a T-TRAK module, due to the depth of the module. If I were to do a second module, though, Doswell, Virginia quickly comes to mind. That's concrete ties?! Wow, that looks pretty good to me. I'll have to take a good look at this when I get around to the track. Exactly. The subtle dip in the tie is far less offensive than the outsized (for us, anyway) ties of the regular stuff.